NEW! NOW READ FOR FREE WITH PRIME KINDLE LENDING LIBRARY AND KINDLE UNLIMITED. A baby vanishes from the womb without a trace. A fossil upends two centuries of scientific theory. A prehistoric virus kills thousands within days. And a resort of epic proportions prepares to open while the world's superpowers secretly watch. 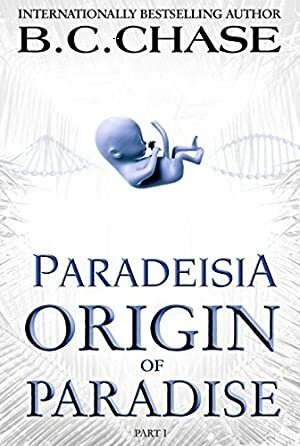 Employing meticulous research into science and antiquity, author B.C.CHASE launches his controversial tour de force, the Paradeisia Trilogy, with a bombshell debut that will have readers clawing from page one through to the final breathtaking chapter. See bcchase.com for trailers, reviews, and news, plus sign up for free book offers. Don't miss the epic trilogy that fearlessly explores the furthest reaches of what's possible. If you are afraid of ideas that challenge your worldview, this book is not for you. Chase holds nothing sacred as he takes a journey into the unknown. This book is part of a trilogy and should not be read apart from the other books in the series. "FOUR OUT OF FOUR STARS." "ONE OF THE GREATEST FRANCHISES OF OUR TIME." "CHASE HAS MASTERED THE ART OF WRITING SUSPENSE." "ONE HELL OF A RIDE!" "PALEONTOLOGY IS GETTING A WAKE-UP CALL." "IN TRUE CRICHTON STYLE, CHASE TAKES ELEMENTS OF KNOWN SCIENCE, EXPLORES THEIR EXTREME POTENTIAL, AND BUILDS A MYSTERY AROUND SCIENTIFIC PRINCIPLES." "I WAS REMINDED OF JURASSIC PARK." "COULDN'T PUT IT DOWN... KEEPS YOU WANTING MORE, MORE." "THIS SERIES IS KEEPING ME UP PAST MY BEDTIME... "
"AN EDGE-OF-YOUR-SEAT PAGE TURNER! I COULD NOT PUT IT DOWN! WONDERFUL!" "INCREDIBLY WELL WRITTEN... RIVETING PLOT LINES, INTERESTING AND FULLY-FLESHED CHARACTERS. ORIGINAL, COMPELLING, AND LEAVES YOU WANTING MORE." "A FORMIDABLE AND UNFORGETTABLE THRILL RIDE." "WHILE THE DIFFERENT NARRATIVES MAY SEEM FAR REMOVED FROM EACH OTHER, THEY COMBINE SEAMLESSLY INTO A BRILLIANT, YET TERRIFYING STORY OF OUR PLANET AT ITS LIMITS, AND THE CHOICES WE ARE LEFT TO MAKE TO SAVE IT." B.C.CHASE is the internationally bestselling author of the Paradeisia Trilogy which critics have hailed as one of the greatest franchises of our time. * His titles have consistently reached the number one slots of science fiction, thriller, women's adventure, religion, and medical bestseller lists. His electrifying talent for combining the latest in scientific breakthroughs with edge-of-your-seat thrills has earned him a reputation as a master of suspense. Amazon has ranked him #1 in Religion and Spirituality, among its top ten Sci-fi authors, and a top 20 writer of Thrillers. "B.C.CHASE IS RAPIDLY BECOMING AN AUTHOR OF AUTHORITY." "CHASE HAS TALENT YOU WON'T SOON FORGET." "CHASE IS A BRILLIANT WRITER WITH A BOATLOAD OF TALENT." "CHASE KEEPS YOU WANTING MORE." Log In to track B.C. CHASE on eReaderIQ. to be notified each time the price drops on any book by B.C. CHASE. to stop tracking B.C. CHASE. We started tracking this book on July 5, 2014. The price of this book has changed 123 times in the past 1,750 days. The current price of this book is $3.99 last checked 8 hours ago. The lowest price to date was FREE last reached on September 19, 2015. This book has been FREE 9 times since we started tracking it. The highest price to date was $12.83 last reached on October 12, 2014. This book has been $12.83 one time since we started tracking it. We last verified the price of this book about 8 hours ago. At that time, the price was $3.99. This price is subject to change. The price displayed on the Amazon.com website at the time of purchase is the price you will pay for this book. Please confirm the price before making any purchases.